A November 27 article in The Deccan Chronicle, by R. Bhaghwan Singh, tells the tale, recounted by Dr. Nanditha Krishna, of the adventures of one of her more colorful ancestors who lived in the 1700’s, and who was the grandfather of the well-known Indian leader, Sir C. P. Ramaswami Aiyer. Today, the C.P. 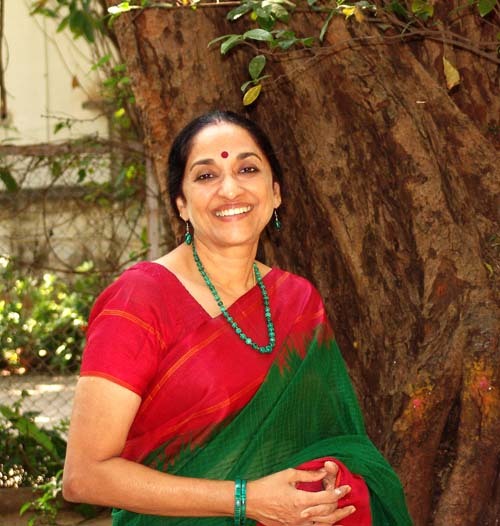 Ramaswami Aiyar Foundation, established to carry on the work he began in his lifetime, along with its affiliate, the C. P. R. Environmental Education Centre, are both run by Dr. Nanditha Krishna, their Honorary Director, and are located in the Grove in Alwarpet, Chennai. Their institutes there include two schools, the Grove School and the Saraswathi Kendra Learning Centre for Children, the C. P. Art Centre, and the C.P.R. Institute of Indological Research Centre, as well as the offices of CPREEC. The C.P.R. Environmental Education Centre (CPREEC) carries out extensive environmental educational programs throughout southern India. A nursery and primary school, and the Shakunthala Jaganathan Museum of Folk Art are located in Kanchipuram and Dalam, an hour or so to the west of Chennai, and another nursery and primary school is in Kumbakonum, further south along the coast. Sir C. P. Ramaswami Aiyar, among the most influential figures in modern Indian history, was a statesman and lawyer, who served for ten years as Diwan of Travancore. A diwan is a chief minister. Travancore was one of the southernmost states of India, located in what is now Kerala. He was originally from Madras (Chennai). He held many offices and left behind a great wealth of writings, having had during his years of public service a major impact in many fields, political, social, and economic; one of the enduring reforms he brought about was the issuance, in 1936, of the Temple Entry Proclamation allowing all Hindus of every caste and class, including the Dalits (“untouchables”) to enter and worship in Hindu temples. Previously, entry to temples had been restricted to the upper castes. He had a striking profile, which still commands attention, even today, and his portrait overlooks the main hall of the C.P Ramaswami Aiyar Foundation, as well as the hall of the Shakunthala Jaganathan Museum of Folk Art in Kanchipuram. 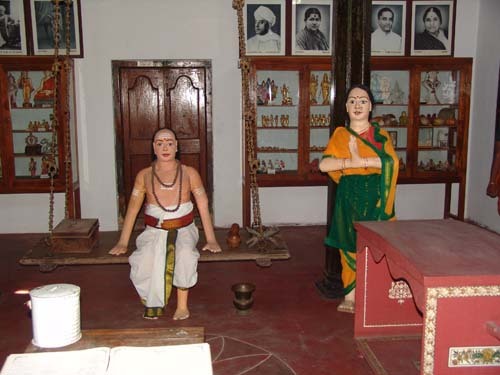 The main hall of the Shakunthala Jaganathan Museum of Folk Art, Sir C.P. Ramaswami Aiyar is in the photo on the wall, fourth from the right. Since it would be hard to exaggerate the respect with which “Sir C.P.” as he tends to be called, is regarded in India—the tale of his adventurous ancestor provides an unexpected, light-hearted background to the family history. His grandfather, Chetupattu Ramaswami Iyer was born the seventh son of a family in North Arcot. A seventh son in those days wasn’t going to inherit much of the family fortune, and to make matters even more challenging, his only education had been a traditional Brahmin one—in yoga, and the vedic scriptures—not likely to equip him in any really down-to-earth way to compete in the changing world of the eighteenth century. To the north of the district lie the Tirupati Hills. The young Chetupattu Ramaswami Dikshitar left his home in North Arcot and set out to seek his fortune in the big city of Chennai on the coast, where he obtained a job as a policeman. 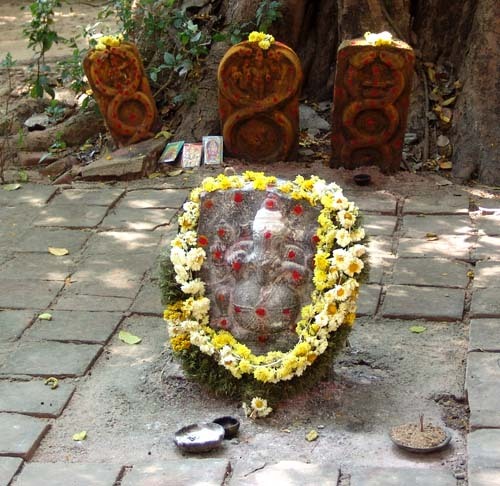 There he took up using the name Iyer (derived from Arya), which was being used by other Brahmins in Madras (Chennai). An enterprising young man, looking for a way to better his prospects in life, he was drawn to an ad offering 5,000 rupees—in those days a gigantic sum of money—as a reward for capturing an outlaw named Arunachalum. He captured the criminal, Arunachalum, collected the award money, and Arunachalam was sent off to prison. However, this was not the end of the story. Arunachalam swore that he would get even. He escaped from prison, hunted down Ramaswami Iyer, and assaulted him at a secluded spot by the roadside. Ramaswami Iyer escaped being killed only by using his yogic skills, which enabled him to control his breathing and pretend to be dead. After he recovered from the beating he had received, he set off again in pursuit of Arunachalam and once more succeeded in capturing him. This time Arunachalam remained in prison and did not escape. Ramaswami collected the reward money a second time. With this ten thousand rupees, he and one of his relatives by marriage bought 100 acres of land in Alwarpet. A few of his descendants later sold off much of the property, but the Grove now stands on the remaining five acres, which today are among the most valuable real estate in Chennai. This land is now the focal point for the work of the C. P. Ramaswami Aiyar Foundation, which promotes Indian culture and art, while educating and advancing the well-being of people of many diverse circumstances and backgrounds. Rudra Krishna, the younger son of Dr. Nanditha Krishna and Dr. Chinny Krishna, and a descendant of the original Ramaswami Iyer has just published a book about his adventurous ancestor: The Onus of Karma. You can purchase it from Amazon.com. I have ordered it, but haven’t read it yet. It looks fascinating! For the website of the C. P. Ramaswami Aiyar Foundation, click here. For the CPREEC Foundation website, click here. For the Facebook page of the Onus of Karma, click here. To read the article mentioned above in the Deccan Chronicle, click here.